Wow! You've learned a lot about how to play guitar chords. We’re finally winding down with the easiest of the rock guitar chords. It’s been a lot of work, but worth it, I think. All right, let’s close down this party. G major is one of those chords that you’re going to see a lot of in your guitar playing career. As usual, we’ll start with the open G.
This chord will take some practice, but once you have it you’ll be a powerhouse! Place your middle finger on the fifth string (A) at the second fret. Press your ring finger on the fifth string (E) at the third fret. Lastly, and this is the stretch, put your pinky all the way over on the first string (e) at the third fret. I know, it feels a little un-natural, but you'll get used to it. You know the drill, when you're learning how to play guitar chords, it’s practice, practice, practice, blah, blah, blah. It really works, though! 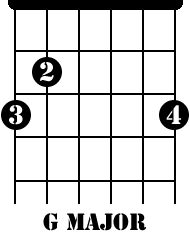 G major can also be played barred at the third fret. Your index finger bars all six strings, and your middle finger goes on the third string (G) at the fourth fret. At the fifth fret, press the A and D strings (5 and 4) with your ring and pinky fingers. That's it. The last G major chord we’ll cover is way up on the neck at the tenth fret, where you bar all six strings with your index finger. With your ring finger, bar the B, G and D strings (2, 3, and 4) at the twelfth fret. OK, admittedly, it’ll be rare that you use this chord, but you never know when it will come in handy. I guess the point is that all the way up the neck, there are easy patterns to follow for these common chords. Once you understand them, your playing starts getting more natural and it becomes easier to figure out what chords are being played in a song. Again, it’s all about how to play guitar chords the easiest way possible. The barred Gm chord is easier to play than the G major chord. Just form the barred G chord at the third fret and then lift your middle finger off the G string. Ok, index finger barring all six strings on the third fret, with your ring finger pressing the fifth string (A) and your pinky finger on the fourth string (D), both at the fifth fret. That's it – simple! You can also do the Gm up there at the tenth fret, but come on, do you really want to? Ok, ok, I’ll walk you through it. So bar the six strings at the tenth fret (index finger again). Place your middle finger on the second string (B) at the eleventh fret. Your ring and pinky fingers go on the D and G strings (fourth and third) at the twelfth fret. Whew! That’s it. That’s the major and minor chords that you're going to run into playing rock guitar. Like I said before, there’s thousands of possible chords out there when you're learning how to play guitar chords. I mean, think about it. We've only covered the standard tuning of your guitar strings (E A D G B e). A lot of artists use alternative tuning when they write. For example, you have the Drop D tuning where you take the low E (sixth string) and tune it down a full step to a D note. This completely changes many of the chords you just learned. OK, I’ll stop. It can make your head spin! Let’s just focus on learning how to play guitar chords with these "normal" chords. We can get all crazy later, once you’re a bonefied guitar hero! To start over at the beginning of how to play guitar chords, click here.